Georgia Law students publish 3 highly regarded legal journals---the Georgia Law Review, the Georgia Journal of International & Comparative Law and the Journal of Intellectual Property Law. These journals, which are frequently cited by federal and state courts, textbooks, treatises and other law reviews, follow the customary format with articles from leading scholars and practitioners comprising the bulk of the content and another section consisting of student notes. The journals provide selected students the opportunity to develop their legal analysis skills beyond the classroom experience. Previous journal members have gone on to clerk for members of the federal judiciary, practice with the most respected firms in the nation and distinguish themselves in public service. Membership on the journals is limited to 2nd and 3rd year students who demonstrate outstanding legal writing and academic abilities. Members are selected based on a combination of grades and performance on an annual legal writing exercise. Participating students may receive up to two hours of credit for their journal work. Published quarterly since 1966, the Georgia Law Review provides insightful legal scholarship and commentary from faculty members, educators, members of the judiciary and legal practitioners. 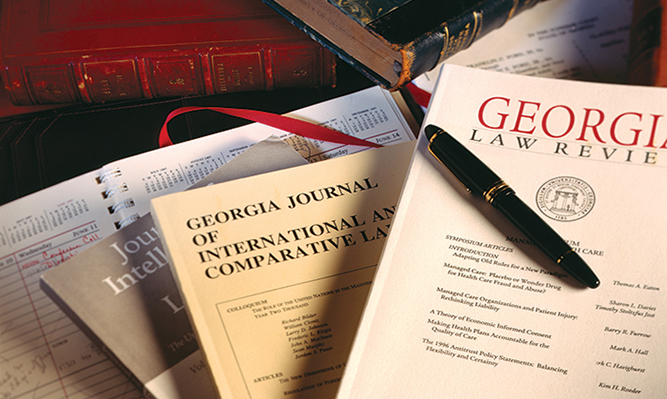 Created in 1971, the Georgia Journal of International & Comparative Law is the pre-eminent forum for academic discussion on global legal issues, theories and developments. Created in 1993, the Journal of Intellectual Property Law is the nation's oldest student-edited journal on intellectual property law. It features articles by students, scholars, judges and practicing attorneys on topics like trademarks, patent law, trade secrets, entertainment and sports law, copyrights and Internet law. Subscribe to one of Georgia Law's three student publications.